Sometimes pipe organs seem to naturally design themselves. Sometimes organs designs evolve, as the tastes and wishes of the client comes to light, as information about the building is confirmed, and as the client's process unfolds. In the case of King Avenue United Methodist Church, the organ's design was truly evolutionary, as the new organ was incorporated into a comprehensive Chancel redesign and refurbishment, and as literally everyone in the Parish was included in nearly every facet of the outcome. The organ which ours replaced was a badly mangled E. M. Skinner organ, located deep within a chamber created in the base of the bell tower, to the right side of the Chancel. The organ's tone opening was covered by a screen, and the parishioners, in a 1970's attempt to create some symmetry in the asymmetrical Chancel, actually painted a replica of the organ grille on the opposite wall. Our original concept, with which the original Organ Committee fell in love, and which motivated them to select us, would have located the new organ in a free-standing case across the front of the Chancel, incorporating four small stained-glass windows into its base (currently in the center and left walls of the Chancel). However exciting and enticing that might have been to the Organ Committee, the Organbuilder, and Consultant, the overwhelming sentiment of the parishioners was to embrace the asymmetry in the Chancel's re-configuration and the organ's design. The goal was to create a Chancel which was comfortable and familiar, tastefully appointed, flexible and suitable for a wide range of liturgical and other Parish activities. The instrument was relegated to the tower chamber on the right, and the asymmetry was balanced by re-location of the piano, choir and curved wood modesty rails to the left, and suspension of a Jerusalem Cross at the center. We were able to convince the Church that the organ should project at least enough into the Chancel so that it wouldn't have to fight to overcome its placement — so that the organ could really be a part of the room. When one is given lemons, one makes lemonade, and uses lots of sugar! Similarly, the tonal design evolved during the life of the project. Originally the budget only allowed for a Divided Swell instrument with three keyboards for coupling flexibility. However, the Church's capital campaign was over-subscribed, and therefore the Church was able to add the necessary stops to turn the instrument into a straight three manual organ. Each division has its own integrity, each relates to one another nicely, each is in excellent proportion. 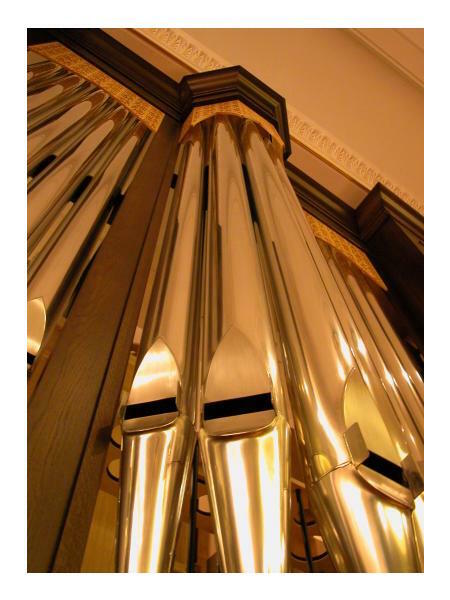 True to the evolutionary nature of this project, the additional stops were installed after the organ was in place, and most of the tonal finishing completed. This instrument is the one-hundredth new pipe organ of our Charles Eames' professional career. It was his challenge to site the divisions and expression boxes within the instrument such that nothing blocks the tonal egress of the expressive divisions at the rear. A Visser-Rowland and Charles McManis alumnus, Mr. Eames' internal designs reflect the sensibility of his experience building tracker and electric action organs. They are efficient, clean, and easy to access for service, always serving the tonal requirements. The tower chamber shares space with a small steel staircase which accesses the bells above. The 16-foot Pedal First Open Diapason and Bourdon parallel the stairs. The instrument is to the side of the chamber away from the stairs against hard reinforced plaster, with the shutters pointing to the church, for maximum tonal effect. One challenge for our Tonal Director, Brian Davis, was to make the enchambered Swell and Choir balance the Great. The Great and Pedal trebles are immediately behind the case's façade, and the enclosed divisions are behind them. To this end, we increased the wind pressure upon which the Swell Organ plays a bit above our standard, and we cut the flue pipes' mouths higher and gave them more wind when we heard the initial result at the beginning of the tonal finishing. The other tonal challenge was to build an organ in a room with no back wall, multiple arched-off balconies, and a dome in the center of the space. Although it is often the case that domes draw an organ's sound away from the listeners below, in this instance we were most fortunate, in that the instrument's balance, blend, and tonal impact are not diminished for those seated under the dome. In fact, we believe it is the hard plaster dome which offers some reverberant life to an otherwise fully carpeted and upholstered mid-west American church building. There is really no rear wall, because the rear of the church is completely open to the gathering area behind, and can only be partitioned off by thick maroon curtains. Surprisingly, when one releases a chord on the instrument, the room gives a little something back! The instrument is truly of our own style. It has a warmth, gravity, and weight of tone which is nicely proportioned through the highest pitched stops. The mixtures lend point to the ensemble, not steeliness. The reeds are all of differing colors, so that they can shade the flues in chorus, or command one's attention in solo work. The Pedal Trombone and Great Tromba extension are directly behind the case's façade pipes, lending a special dignity to profound pedal lines, and a greater contrast between it and the Swell/Pedal 16-foot Bassoon, which is farther back in the chamber. The instrument plays music from any period very musically, with an informed historical viewpoint. For example, a recent visitor played both a Vierne Symphony and the Bach "Sie Gegrusset" variations with registrations which made the entire organ sound different — dare I say nearly authentic — for each context in which it was used. I would like to take this opportunity to thank the people at King Avenue United Methodist Church for commissioning us to build this instrument, and to Consultant Robert Griffith; to my entire staff whose tireless efforts have created the success of this instrument, with special gratitude to Charles Eames and Brian Davis. We are also excited about the instruments under contract which will follow this organ in our production schedule. 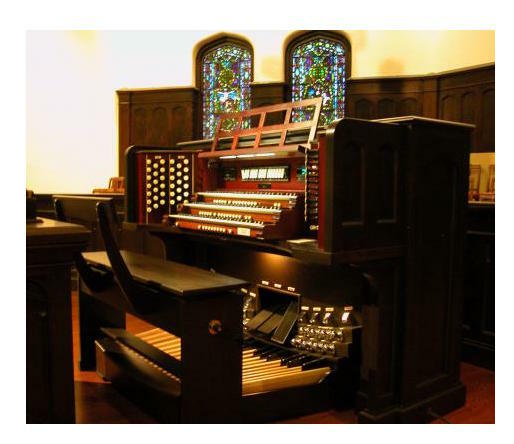 Currently, we are building a large three manual organ for Second Presbyterian Church of Bloomington, Illinois, which will be followed by organs in San Antonio, TX, Raleigh, NC, and Richmond, VA.